Oswald J. Smith frequently warned pastors, “The church that does not evangelize will fossilize.” Bearing the responsibility to lead God’s people to be consistently and intentionally evangelistic can be a heavy task. Pastors often feel too exhausted and overwhelmed to give evangelism the primary attention it deserves. Based on his own pastoral experience in the local church, Southwestern Seminary evangelism professor Matt Queen has written a practical guide for pastors who want to champion evangelism in their congregations. 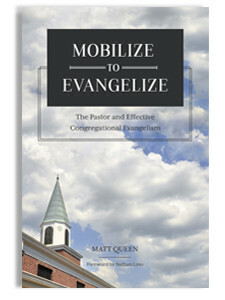 Mobilize to Evangelize provides pastors with tools they need to understand and to assess how evangelism is conceived, practiced, and perceived in their congregations. It offers realistic ideas they can implement to mobilize their congregations to evangelize. Matt Queen serves as the L.R. Scarborough Chair of Evangelism (“Chair of Fire”) and associate professor of evangelism at Southwestern Baptist Theological Seminary in Fort Worth, Texas. He evangelizes with students weekly through “Going the Second Mile,” an initiative to evangelize every household within a two-mile radius of Southwestern Seminary’s campus. His previous church ministry includes serving as senior pastor, associate pastor for evangelism and discipleship, and minister of students and music. He regularly leads “Everyday Evangelism” workshops and preaches revivals in churches across the country.